ANOTHER SCI-FI ANIME CLASSIC FROM THE PEN OF KATSUHIRO OTOMO (AKIRA) In the year 2041, mankind created their first space colony on the moon. But after a freak cataclysm devastated human civilisation on Earth, the republic of the moon built a domed megalopolis known as Eden. Now in the year 2267, a boy called Takeru spends his time engaging in hover-craft races against rival street gangs, unaware that he is about to embark in the journey of unearthing Eden's origin. 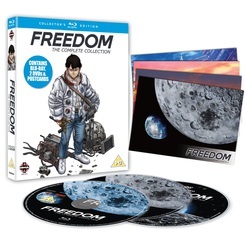 This limited edition Collector's Edition includes All seven episodes of Freedom in HD on one Blu-ray disc plus the series on two standard definition DVD discs as well as a beautifully designed slip cover and bonus set of four art cards.